When discussing puberty with your daughter, be open and direct with her about the new changes she will soon experience. Encourage her to come to you with any questions or concerns she has. Talking to her early with empathy and honesty established strong communication and trust between you that will last through her teen years. Let your daughter know that she is not alone in her journey to adulthood. 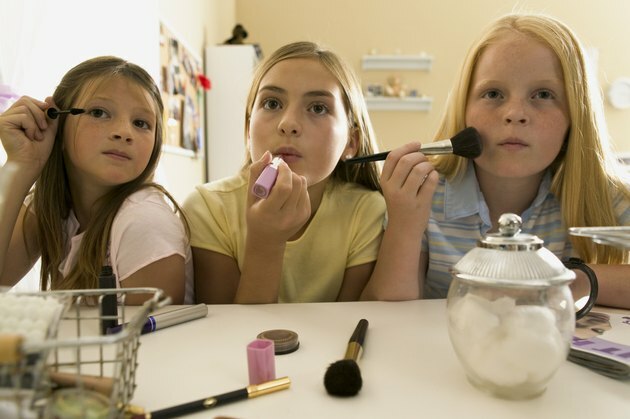 Puberty starts at varying ages for different girls, but it usually begins between the ages of 8 and 13 and continues through the ages of 16 to 18. Puberty is a natural process which all young girls will go through -- hormonal changes begin and a young girl's body begins to mature. Explain to her that as a young girl matures, breasts will begin to grow, body odor will become more pronounced, a growth spurt will begin, hair will sprout in her armpits and vaginal area and she will start her monthly period. Let her know that handling each of these changes can be a challenge at first as she may feel very awkward and self-conscious. One breast may initially be larger than the other, feet may become large quickly and may not seem to match the rest of her body, acne may appear and she may tower over the boys and even some of the girls in her age group. Her body may become curvier and her hips wider. She may gain extra weight, which may cause even more anxiety. Over time, she will become more confident and less anxious about these bodily changes. The pituitary gland is located at the bottom of the brain -- explain that when it begins to produce new hormones, especially estrogen, mood swings, irritability and sensitivity can result. Tears and outbursts can occur at any time. She may become short tempered and even confused at times. Sexual feelings and urges may also arise. Let your child know that these feelings are natural and that you will help her cope with her ever-changing temperament and anxieties and that you will also be there with support and a source of information when she is insecure or fearful. If she is uncomfortable talking to you about puberty issues, advise her that she has other sources to turn to for reassurance and assistance. School nurses, counselors, teachers, doctors and church pastors are all excellent professionals to ask for information and advice if necessary. Let her know that if she feels the need to speak to others about her issues, you will still always be there for her if she wants to talk or needs advice.